Taylor Anderson is a gun-maker and forensic ballistic archeologist who has been a technical and dialogue consultant for movies and documentaries. He has a Master’s Degree in History and teaches at Tarleton State University in Stephenville, Texas. Find extra drawings and diagrams at Taylor Anderson‘s website. CLICK HERE FOR MORE STORIES BY TAYLOR ANDERSON. The men and two women of the USS Walker are worn out and homesick. They’re resigned to being stuck on a parallel world, but they at least hope to find some more humans. There’s a severe “dame shortage” so, though Commander Matthew Reddy and Nurse Sandra Tucker are in love with each other, they know they must not indulge their feelings because it might lower the morale of the rest of the destroyermen. The 100 remaining American destroyermen have now been in their strange new world for 16 months. They’ve just had a major victory against the evil Grik, but they know their respite will be short, for the Grik seem to have an unending supply of soldiers. 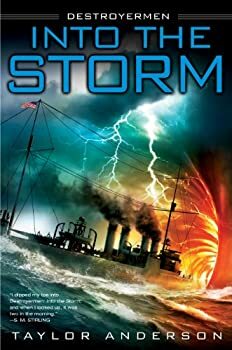 If you’ve been enjoying Taylor Anderson’s DESTROYERMEN series, there’s no reason to stop now. 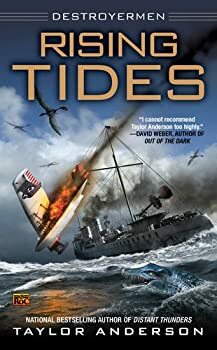 Rising Tides (2011) is another quality installment in which we do a lot of sailing, have some fun and laughs, and barely survive some frightening events — exactly what we were expecting. 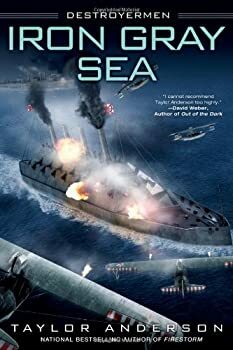 Iron Gray Sea (2012), the seventh book in Taylor Anderson’s DESTROYERMEN series, begins with the sinking of a battleship and then a wedding. 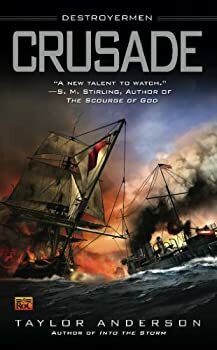 The remaining Destroyermen are all together to witness the marriage of Captain Matthew Reddy to Lt. Sandra Tucker, but soon they must disperse again because they and their allies are still fighting all over the world on several fronts, and they are spread thin. Their own technology is advancing rapidly but, with the help of the Japanese, so is the Griks’. Not only are the bad guys making better weapons and using better military strategy than they did before, but they are also using genetic engineering to create better soldiers. The allies must stay ahead of the Grik and get control of the sea and the air and, maybe eventually, the land. 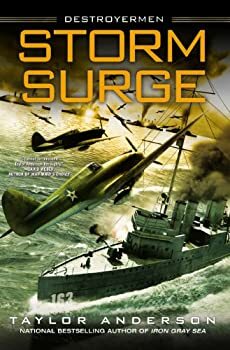 Storm Surge (2013), the eighth book in Taylor Anderson’s DESTROYERMEN series, is exactly what I was expecting, which means that while I enjoyed checking in on Captain Reddy and his crew and alliances in the alternate earth they found themselves in during WWII, I continued to wonder how long Anderson can draw out this war. 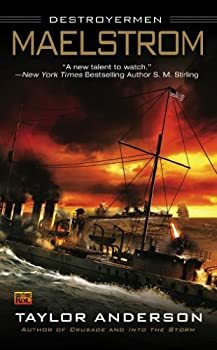 Sure, world wars take years, so it’s not that I find the plot unrealistic (excepting the part about the parallel universe), but it’s just that I don’t really want to read about the same war for 154 hours (which is how long the series, so far, takes when reading it in audio format). 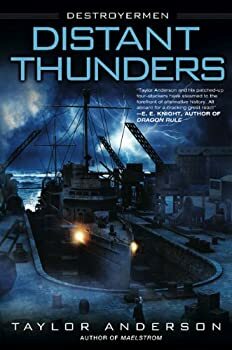 I love Taylor Anderson’s characters and the world he has built in his DESTROYERMEN series, and the audio editions of these books are wonderfully performed by William Dufris. 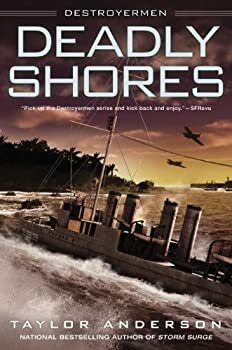 But Deadly Shores (2014) is the ninth book in the series and the war, which is pretty much the focus of the entire plot, seems like it’s still winding up. There’s just no end in sight. There are a couple of personal changes for Captain Reddy’s crew and alliances, including the death of an important character, alliances are starting to shift, a possible new enemy is discovered, we meet a few strange new creatures (including flying saber-toothed squids), Courtenay makes a suggestion about how the world works, Silva plays a few pranks, and there are a couple of exciting battles. 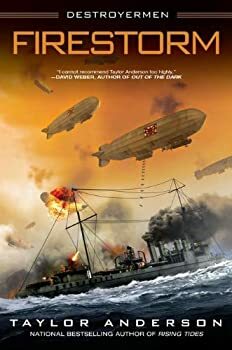 My reviews for Taylor Anderson’s DESTROYERMEN series are getting shorter and shorter. That’s because, with each book, I have less to say. Here’s the bottom line: Taylor Anderson has created a wonderful world full of loveable characters. It’s fun just to hang out with them. However, at this point, it feels like that’s all what we’re doing: just hanging out. Sure, there are battles and a bit of personal drama, but it’s all stuff we’ve seen before. 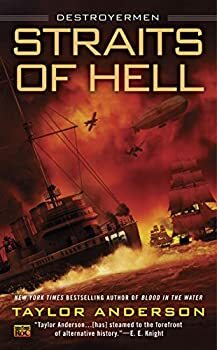 In Straits of Hell (2015), book 10, Matthew Reddy and his crew and their allies are once again fighting Don Hernan’s Dominion on one side while they fight the second battle for Grik City on the other.